Home investors are a savy breed. They are able to visualize and revitalize an old Abbotsford real estate property into something special and unique again. Real estate trading as known as "flipping a house" is a common term that you may have heard of. With all the older homes in the Fraser Valley, this can be a viable option for those home investors that are able to maximize the profits while keeping a handle on the expenses of a renovation or home improvement project. The buy and hold real estate investor normally rents out a newly renovated property and collects the rent acting as a landlord. This home investor is the patient type that waits for the real estate property value to increase over time and pay off the mortgage in order to collect the rental fees free from debt. Abbotsford has many different communities would be attractive to a home investor for the purposes to either remodel or as an investment property. Heritage communites include Abbotsford West, Central Abbotsford, Matsqui, Sumas which boast older style homes. Sumas Mountain has newer houses in the their neighbourhood. Abbotsford borders the township of Langley and Mission. Abbotsford real estate is appealing to home owners because the divisity of the properties match the diversity of the Abbotsford population. Some may want acreage and a farm house other may want a urban lifestyle to walk to local shops and amenities. 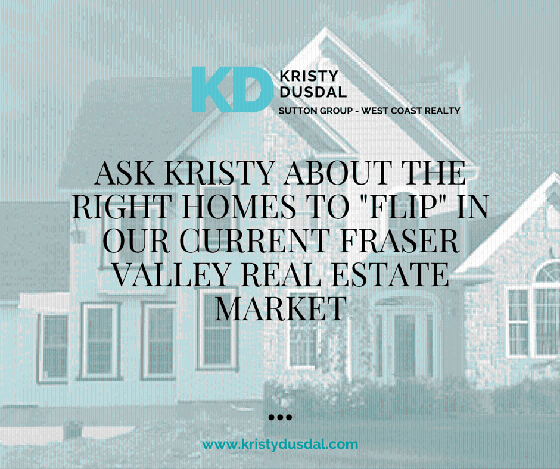 Kristy Dusdal can help you find the perfect investment property for sale in Langley, Abbotsford and Chilliwack to meet your needs. Her experience and Abbotsford real estate knowledge finds the gems in this diverse market. Turn something old into something luxurious looking to appeal to a wide range in the Langley real estate market. No matter whether you are remodeling an older home, a townhouse or a run down looking apartment your imagination can be free to design and inspire others. Connect with Kristy Dusdal and speak with her about Abbotsford real estate listings.